The doors to Crane & Turtle just opened, giving Petworth’s Upshur Street yet another upgrade. Benches outfitted in sea-colored upholstery line the walls of this shoebox sized French/Asian restaurant from Paul Ruppert, and an ellipse of counter seats look into the busy kitchen. Its small size may be an adorable anomaly in this city, but in Japan (where charming corner cafes dominate) Crane & Turtle would fit right in. 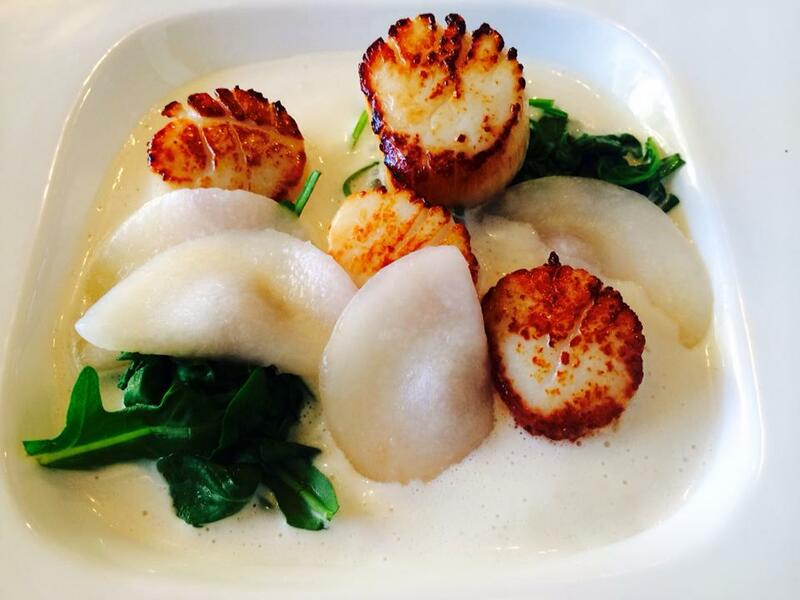 The Best Thing on the Menu: Sautéed Maine Scallops with Chorizo Tapioca Dumplings, Arugula and Gingered Coconut Foam is something you’d expect to see somewhere exquisite…like CityZen. Oh wait, Chef Makoto Hamamura was a fixture in that kitchen for seven years, so it all makes sense. He’s a true talent and now has a spot to call his own. The scallop dish may just be the best thing we’ve eaten THIS YEAR. Perfectly seared scallops sit in a bubble bath of coconut foam and bitter greens where they are joined by tapioca dumplings stuffed with single pearls of chorizo sausage. The party of textures is divine. Other top dishes on the menu include hay smoked crudos and cherry gazpacho with clams and kakiage. If it’s possible to have one gripe though, it’s with the “drunken fish” dessert. It’s presented like the traditional Japanese festival dessert called “taiyaki” which has now autocorrected to teriyaki ten times. Ahhhh. 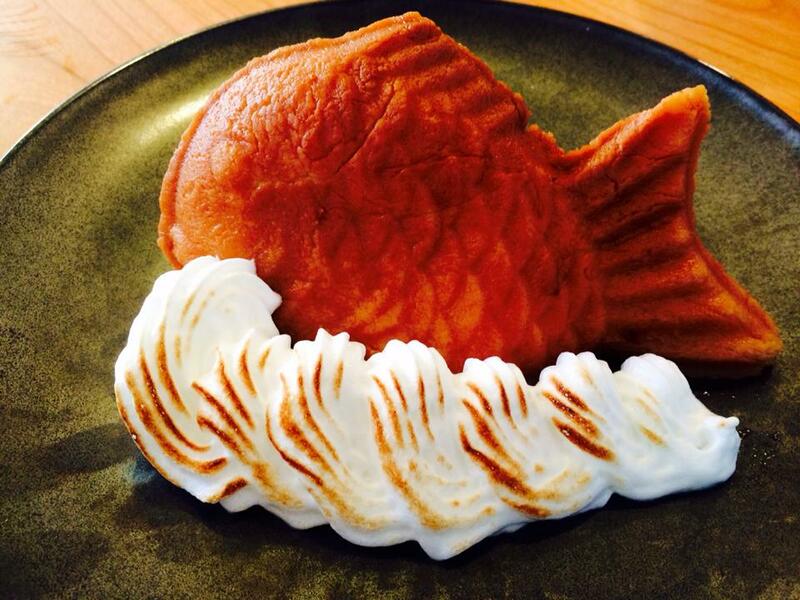 The treat is typically a piping hot fish-shaped pancake filled with a sweet red bean paste central to most Japanese desserts. Crane & Turtle’s take is a chilled taiyaki cake that’s been soaked in booze (very fitting for the summer months). But why the fig filling instead of adzuki beans? Fig seeds are gritty and turn the dish into a Fish Newton. Maine scallops not your BTM? Share your favorites in the comments section. This entry was posted in Restaurants and tagged Adzuki Beans, Cherry Gazpacho, Chorizo Tapioca Dumplings, Cityzen, Crane & Turtle, crudo, French, Japanese, Makoto Hamamura, Paul Ruppert, Petworth, Scallops, Taiyaki, Upshur Street. Bookmark the permalink.